From the left : Chea Nareth , His Excellency Mr. Phlok Phan, Archbishop Willem T.P Simarmata, His Excellency Mr. Him Chhem, Dr. Mathews George Chunakara and Augustine Karmakara. Phnom Penh: A three-member delegation composed of three Officers of the Christian Conference of Asia (CCA) met with the officials of the Ministry of Religion of the Cambodian government. 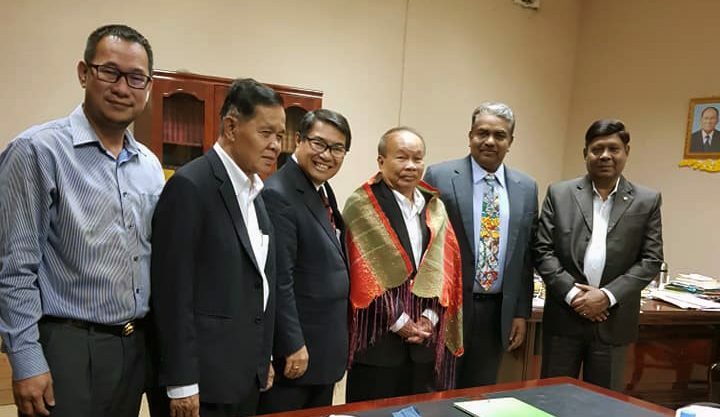 The Officers of CCA, Archbishop Willem T. P Simarmata (Moderator), Dr. Mathews George Chunakara (General Secretary) and Augustine Dipak Karmakar (Treasurer), were received on 18 January 2019 at the headquarters of the Ministry of Religion in Phnom Penh. His Excellency Mr. Him Chhem, Minister of Religion, His Excellency Mr. Phlok Phan, Deputy Minister and Permanent Secretary of State, and Mr. Chea Nareth, Director of Cabinet together with a team of other high ranking officials of the Cambodian government were present at the meeting with the CCA leadership. During the meeting, the trend related to the religious situation as well as the policies of the Cambodian government with regard to religious freedom, inter-religious relations as well as the constitutional and legal guarantees for protecting the rights of religious minorities in the country were shared with the CCA delegation by the authorities. “The people of Cambodia, who once experienced traumatic experiences of violence and inhuman situations, today want peaceful co-existence of its citizens. The leaders of the Cambodian government are committed to ensuring peace and security to all Cambodians irrespective of their religious or ethnic identity”, said Minister Him Chhem. “The constitution of Cambodia guarantees freedom of belief and religious worship, provided that such freedom neither interferes with others’ beliefs and religions nor violates public order and security. Cambodian government wants to strengthen inter-religious cooperation among the followers of all religions in the country”, added the Minister. The Moderator of CCA Bishop Willem T.P Simermata said, “CCA has strong commitments to nurture and support inter-religious cooperation, and CCA encourages and motivates its members to focus on programmes aiming at building peace and religious harmony among people and communities”. Cambodia is one of the very few countries in Asia which has a separate Ministry for religious affairs. Officially known as the Ministry of Cult and Religion, a constitutionally mandated authority of the Cambodian government, the ministry is headed by a cabinet minister and a deputy minister and permanent secretary of state for religious affairs. The constitution of Cambodia establishes Buddhism as the state religion and it prohibits discrimination based on religion. The rules and regulations of Cambodia require all religious groups, including Buddhist groups, to register with the Ministry of Religion to conduct any religious activities. The laws mandate that religious groups must inform the government of the goals of their religious organization, describe its activities, funding sources, and affirm a commitment to refrain from insulting other religions as part of religious propagation. According to the Ministry of Religion sources, about 95 percent of Cambodia’s 16 million population today are Theravada Buddhists. Ethnic Vietnamese who reside in the country traditionally practice Mahayana Buddhism. Approximately 2.5 percent of the populace is Muslim, and 2 percent is Christian. The remaining population includes Bahais and ethnic Vietnamese Cao Dai. The Christians affiliated to 19 ecumenical and ecclesiastical organisations registered with the Ministry of Religion include a total of 300,000 Protestants and 20,000 Roman Catholics. According to Dr. Mathews George Chunakara, General Secretary of CCA, the Kampuchea Christian Council (KCC) which was initiated by CCA in mid 1990’s is one of the first three organisations registered with the Ministry of Religion in 1998 ever since the government of Cambodia introduced a new system of official registration for religious groups. The KCC became an official member of CCA at its Tomohon (Indonesia) assembly in 2000. The people of Cambodia have passed through a very turbulent history and acute suffering when compared to any other Asian country. The repressive regime of the Khmer Rouge, led by its brutal leader Pol Pot, was responsible for the Cambodian genocide that killed more than two million people. Throughout the Pol Pot era, all religions were prohibited and Christianity was totally wiped out. Subsequently, the new People’s Republic of Kampuchea government which was supported by Vietnam also prohibited religious practices, hence the physical presence of religious practices had long disappeared in Cambodia. It was only after the adoption of the new constitution in 1993 that freedom of religion was introduced in Cambodia after a long interval of almost three decades. “The World Council of Churches (WCC) and the Christian Conference of Asia started working in Cambodia without any religious motives ever since the reconstruction started after the Pol Pot regime was thrown out. The work of the global and regional ecumenical organisations through a field office set-up by WCC in 1980 facilitated and coordinated humanitarian aid, as well as reconstruction of Cambodia, from 1980-1994”, recollected Mathews George Chunakara who had served as a special envoy of WCC and CCA special programme for Vietnam, Laos and Cambodia in early 1990’s. The early days of the new year witnessed the Cambodians ushering in 2019 with fireworks and celebrations marking the 40th anniversary of the ouster of Pol Pot in December 1978, and the 20th anniversary of the end of 30 years of civil war. It is officially recorded that Cambodia’s civil war finally ended on 29 December 1998 when surviving Khmer Rouge leaders finally surrendered.